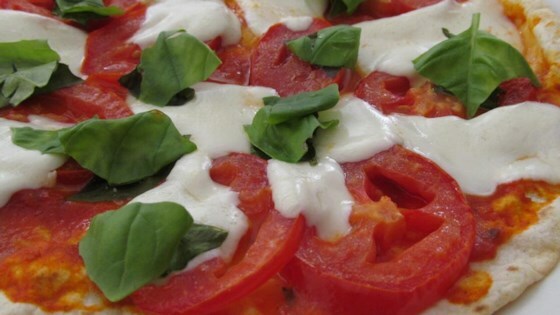 "Basil pesto, fresh mozzarella, roasted tomatoes and fresh basil leaves top a crispy flatbread for individual pizzas. Don't worry if you don't have time for the dough to rise to make the flatbread - this uses store-bought flour tortillas as an alternate base. Quick, easy and delicious!" Spread tomato slices out on baking sheet. Drizzle some olive oil over slices. Broil in the preheated oven until tender, about 6 minutes. Remove from oven and cool until easily handled, about 5 minutes. Peel skin off slices; discard. Preheat oven to 375 degrees F (190 degrees C). Line another baking sheet with aluminum foil. Brush both sides of each tortilla with olive oil and arrange on baking sheet. Bake in the preheated oven until lightly browned and crispy, about 8 minutes. Remove from oven and let cool, about 5 minutes. Spread 2 to 3 tablespoons of pesto in a thin layer over each tortilla. Top with mozzarella cheese slices, 8 basil leaves, and some roasted tomato slices. Bake in the preheated oven until mozzarella cheese is melted, 6 to 8 minutes. Cool slightly, about 2 minutes, before slicing with a pizza cutter. You can substitute the basil pesto base with homemade pizza sauce as an alternative for family members who don't like pesto.